When one of the inventors of Dungeons & Dragons died in 2008, (Uncle John) was surprised that his name wasn't more familiar. That made him wonder: how many other people have never heard this story? In Gygax's free time, he loved to roll dice of a different sort: He played war games in his home with fellow members of a club called the Lake Geneva Tactical Studies Association. There, on a giant table in the basement - just as war gamers had done since the invention of Kriegsspiel in the early 1800s - Gygax and his friends re-created famous battles such as Gettysburg or the D-Day landings of World War II and fought them all over again in miniature, devoting countless hours to killing each other's soldiers with one roll of the dice after another. Participating in these games could be a war of attrition in its own right: Mapping out the battlefield took time, and so did setting up dozens and dozens of miniature soldiers just as they would have been positioned in the real battle. War gamers prided themselves on historical accuracy, and this meant that while the main campaign was being fought across the tabletop, countless other battles raged around it as players bickered over one arcane historical point after another, often brandishing military histories and biographies as they argued. 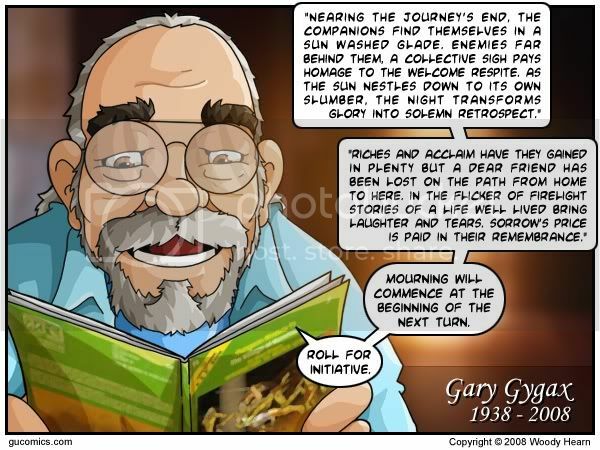 Add to this the fact that a single military campaign might drag on for months, with war gamers meeting every weekend in Gygax's basement until final victory was achieved, and it's easy to understand why the hobby was popular with only a limited number of people. Just as they had since the invention of Kriegsspiel, gamers were constantly writing new rules for existing games as well as inventing new ones. Gygax was no exception: In 1968 he took four pages of rules that a friend had written for a game set in the Middle Ages called Siege of Bodenberg and expanded them to 16 pages, creating a new game called Chainmail. Each player still had a dozen or more plastic soldiers, but instead of each figure representing op to 20 men as had been standard in other games, Gygax had each figure represent only one soldier. Chainmail was an interesting departure from other war games, but after several weekends it started to get boring and attendance at the gaming sessions began to drop off. One afternoon Gygax decided to try something new: He grabbed a plastic dinosaur off a shelf and declared it to be a fire-breathing dragon. Then he took an oversized figure of a Viking warrior and said it was a giant. And then he created a wizard who could throw fireballs and lightning bolts and a "hero" character that had four times the strength of an ordinary character. This fantasy element alienated many of the most orthodox war gamers, but plenty of other people liked it - soon Gygax's basement wasn't big enough to hold all the players who wanted to play in his games. He wrote a fantasy supplement to the standard CHainmail rules and published it in 1971.